London is such a perfect city for a foodie. I’m already totally infatuated with it, simply because of the sheer number of massive food markets. The whole “London has terrible food” stereotype is so not true, you just have to know the right places to go! I went to Camden Market last week (and forgot my camera, oops! Sorry guys) and ate SO much good food. These markets just have rows upon rows of food stalls. People making foods of every ethnic variety, and serving it up in aluminum tins for a couple pounds. Naturally, I want to try everything, so I greedily grab every sample extended to me and split as many things as possible with my friends so we can try as many things as we can before our stomaches explode. OK, let’s start with the few pictures I have of the Camden Market. First up is this churro. Oh my goodness you guys, this churro. 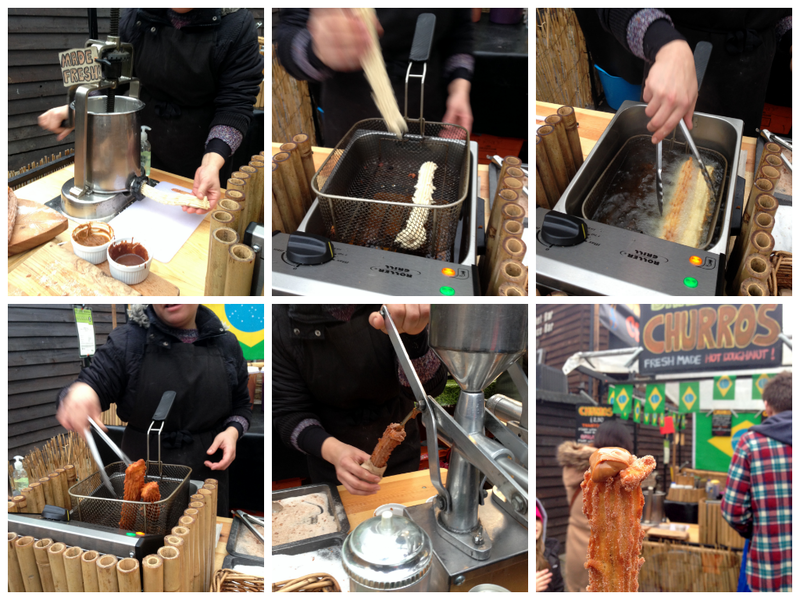 In the picture collage thing, you can see the brilliant lady who made our churro press the dough out with a hand crank, fry it fresh in front of us, and then fill it – we got half chocolate and half dulce de leche. For real – this churro was OUT OF THIS WORLD. I would eat it every day if I could. It was fresh, piping hot, and filled with my favorite things. 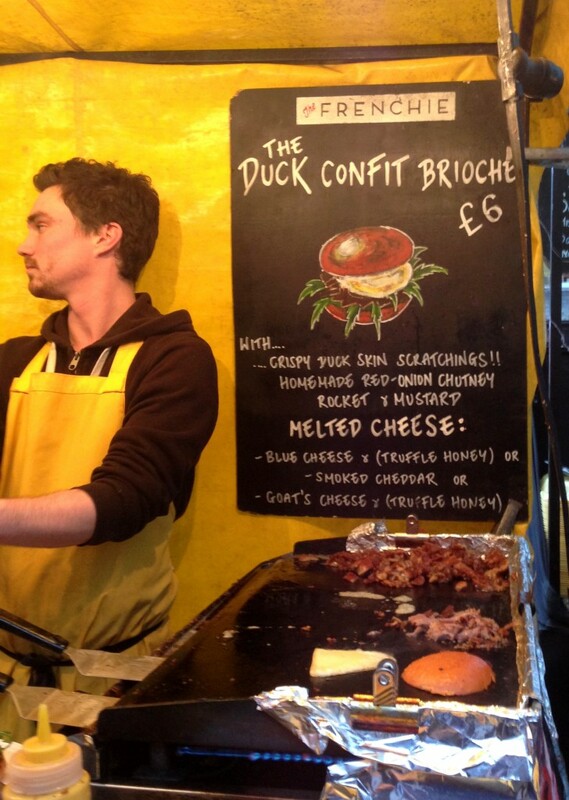 Seriously, if you go to Camden Market, this is a must try. This sandwich. You guys, seriously, this was one of the best sandwiches I’ve ever tasted. The first thing I noticed about this stand was the piles of buttery, soft brioches buns. I turned to my friends to comment on how beautiful the bread was, and then we all started noticing how good the whole sandwich looked. 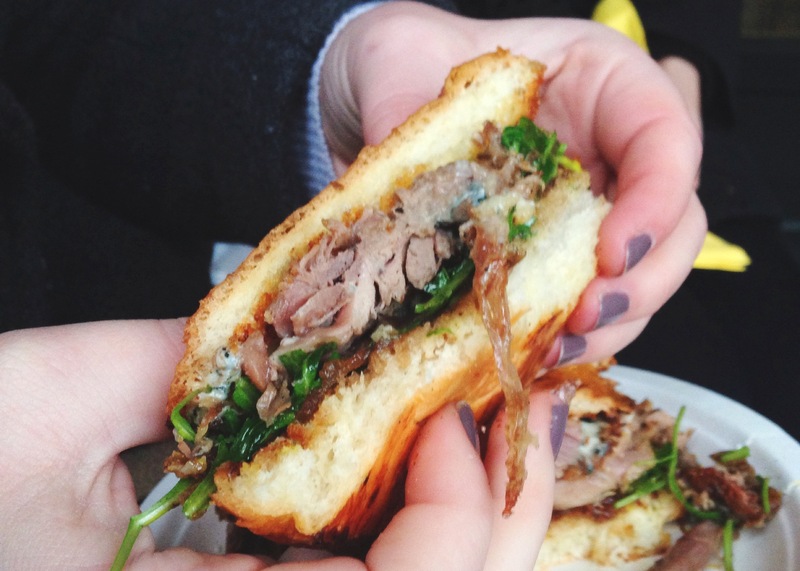 C’mon now – grilled duck confit, with crispy duck skin, red onion chutney, rocket, and mustard, with your option of cheese. We went with blue cheese (which normally I hate, but the super sweet guy said it was mild and sweet. He was right) and a drizzle of truffle honey. They were sweet enough to cut it into thirds, and I swear, we each demolished our third in seconds. This sandwich was the perfect mix of salty, sweet, crunchy, soft, tangy, and every other thing you could want in a sandwich. It was some true artisan food, and you could tell the adorable guys making them were putting love into every sandwich. So, sooo good. 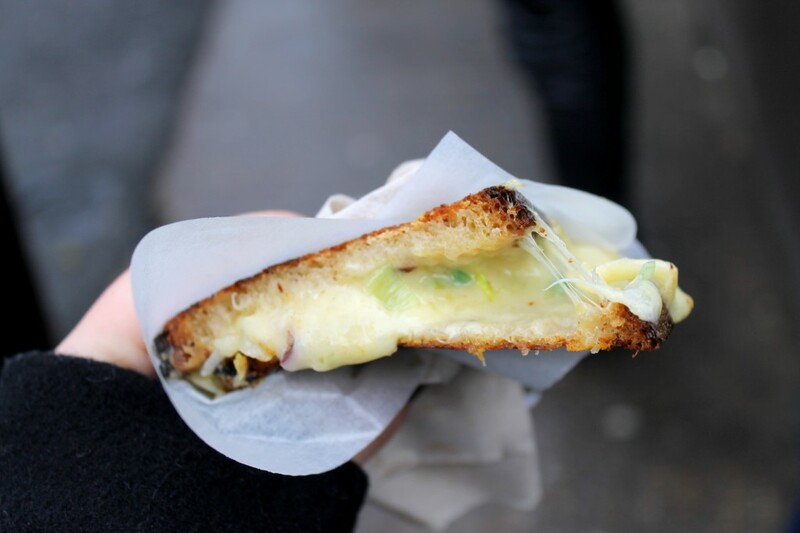 If you go to Camden market, you NEED to try this. 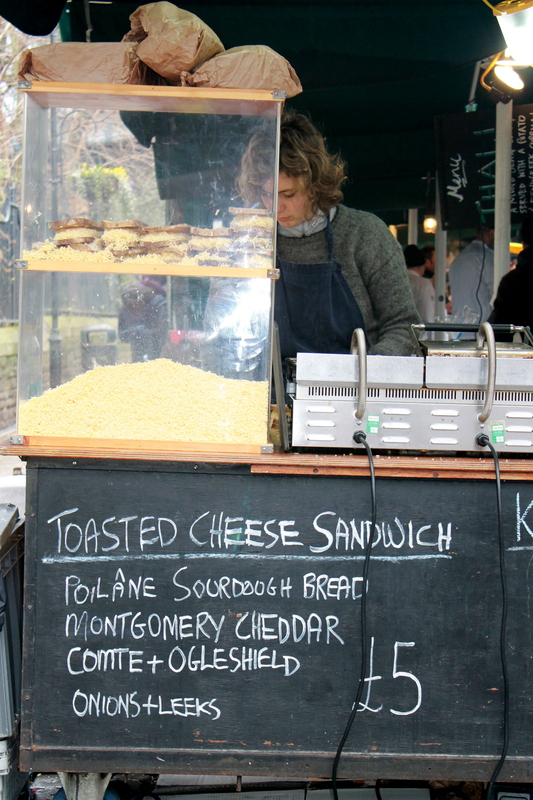 One of the things we tried at Borough Market was these bourekas – something Paige nor I had every had before! We opted for the potato and onion, because it’s not a flavor combo we normally go for. 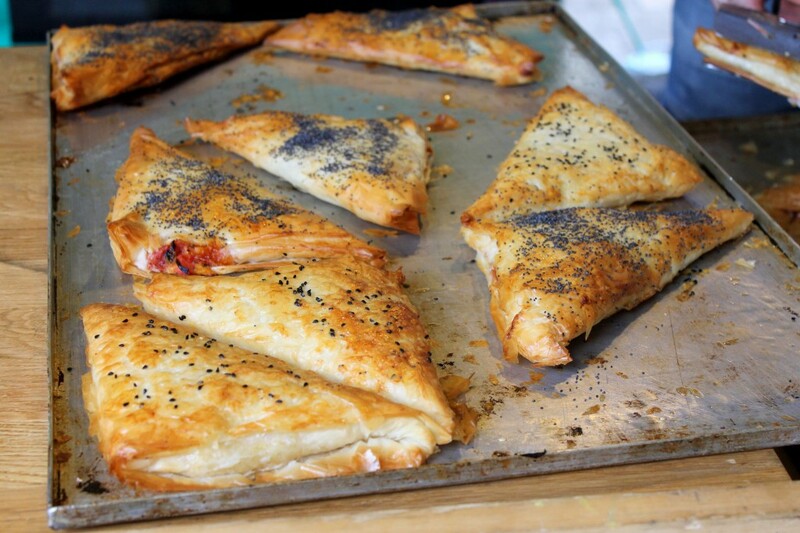 These pockets were delicious, and so ridiculously flaky. Definitely a yummy treat! 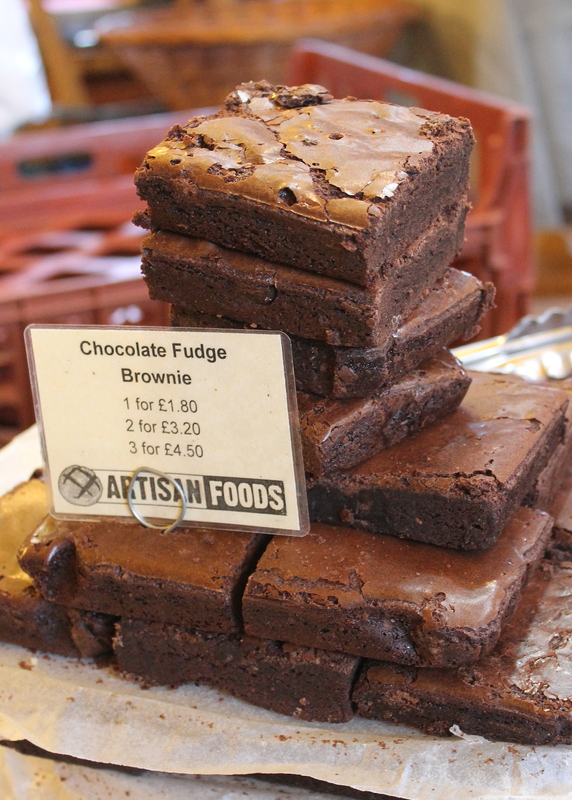 These brownies looks so gorgeous and fudgy, I couldn’t help snapping a pic. 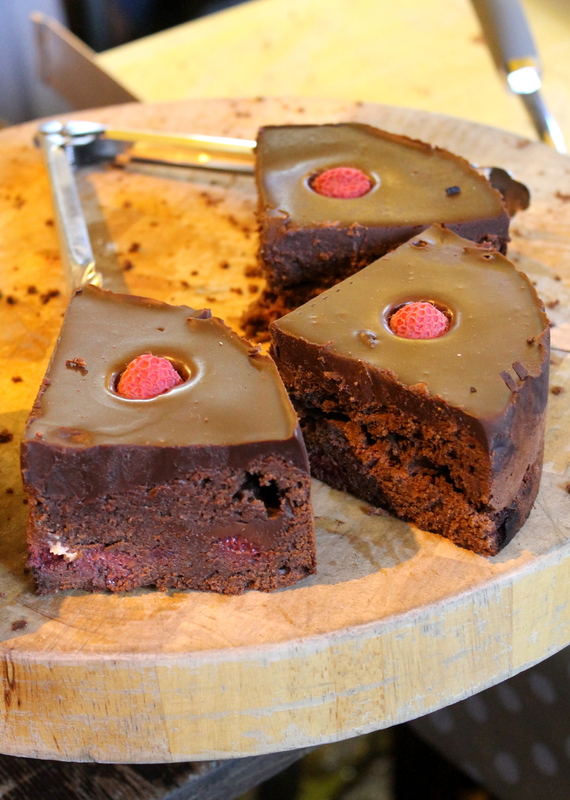 We surprisingly didn’t actually try any of the sweets, but if we had…these brownies totally would have been on the list. 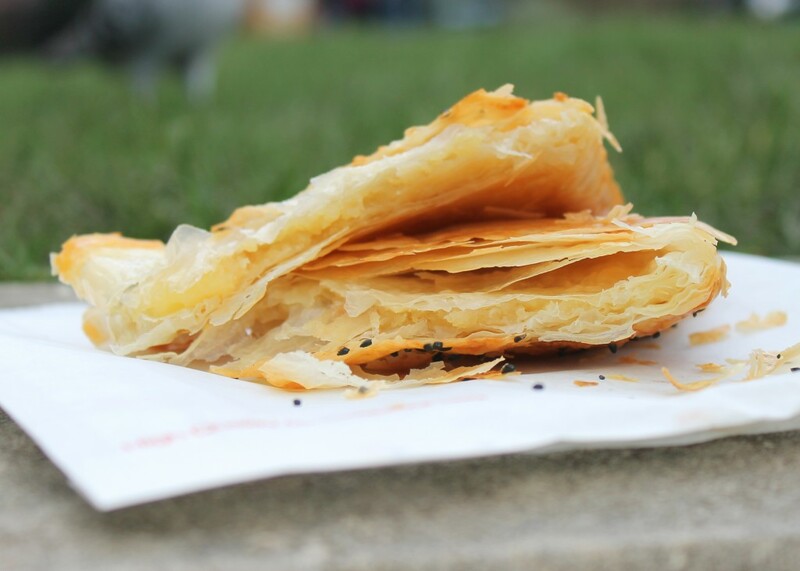 That flaky top is calling my name! Those are pepperoni samples on top of that crate. SO GOOD. If I owned a pizza shop, that would be the pepperoni I would want to put on my pizza. Absolutely delicious! The little store had tons of amazing sounding freshly made pastas, and they had a huge sign saying what they did every night, all night. They spent hours hand crafting each of these raviolis. I need to go back to try some of these. 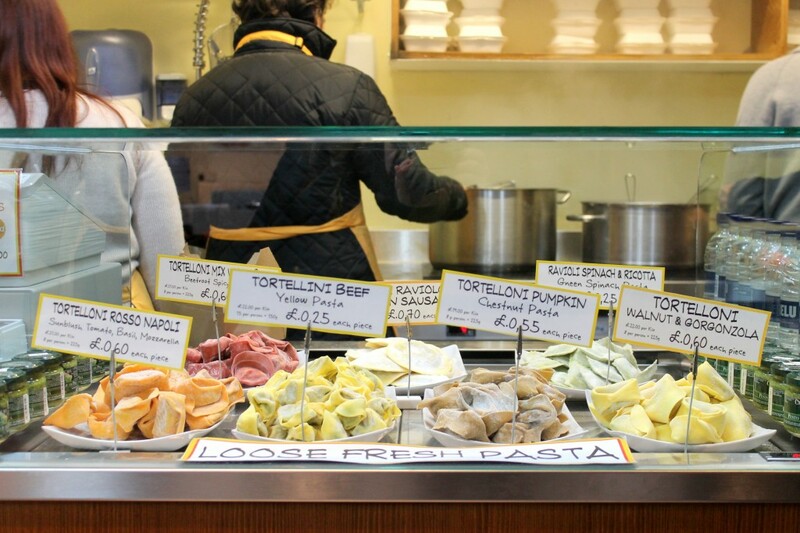 We were so stuffed by the time we stumbled across it, but those tortellini are calling my name. I loved all the fresh produce they had! All of it was so gorgeous and vibrant. Look at that top picture. See that glass case? And that little mountain underneath the sandwiches? That’s ALL CHEESE. This sandwich was so cheesy and crunchy and delicious. It was a grilled cheese to the max, and the long line was so well worth it. The combination of cheeses used was spot on, and I loved the flavor that the leeks and onions brought to the party. Such good, cheesy comfort food. 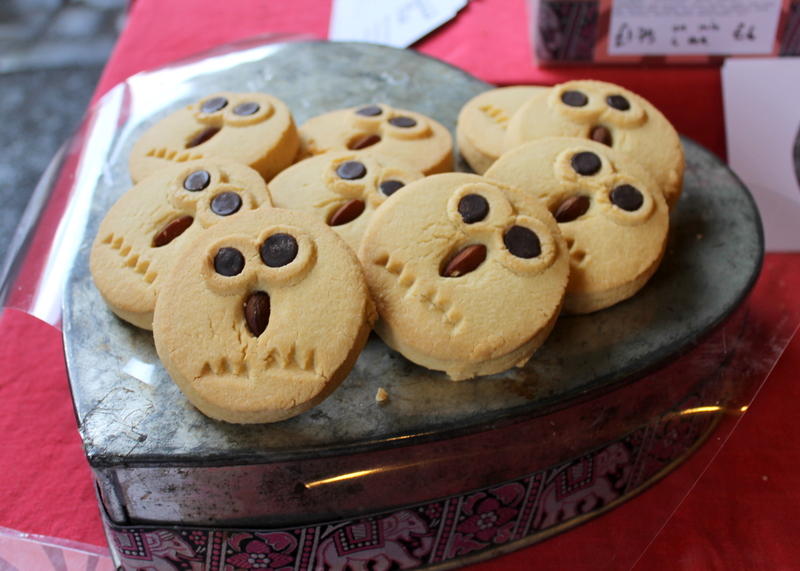 These owl cookies were too darn cute not to snap a picture of! That focaccia…man, I was dying to rip into one of those loaves. They all looked soo good! 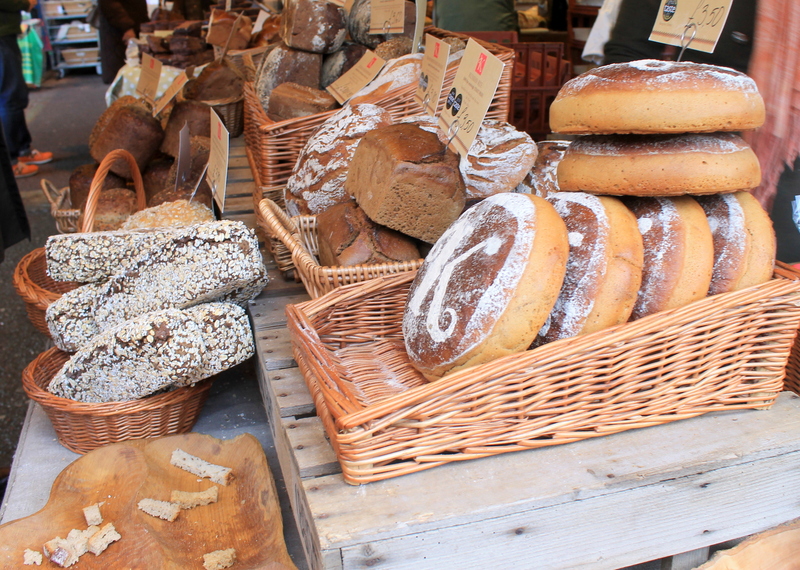 I seriously love bread, and the samples I nabbed of these bread was absolutely amazing! Look how gorgeous it is too – the bakers are truly artisans. You can’t see all the loaves in this picture, but they were all like works of art. 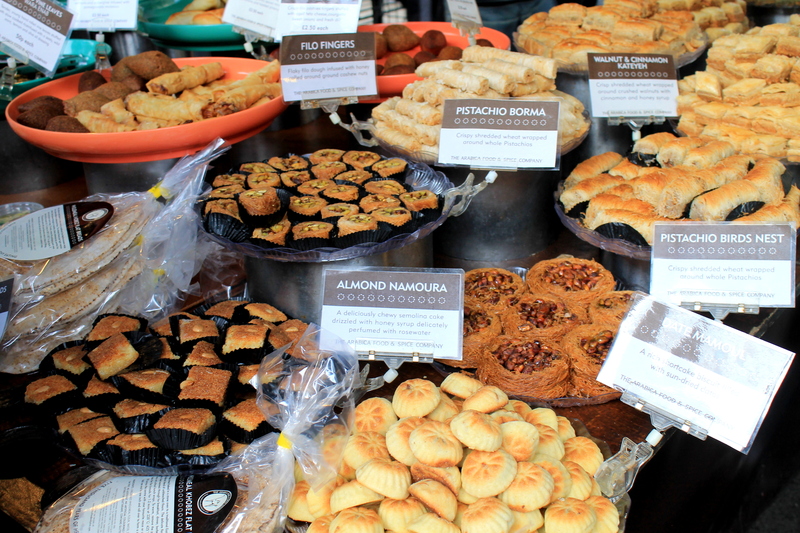 These Greek pastries were all so pretty! I love that Pistachio Birds Nest towards the right. It looks so cute! Chocolate Raspberry Cake. This was at the same place as those brownies. Oh my, it looks so dense and fudgy – just like a chocolate cake should be! 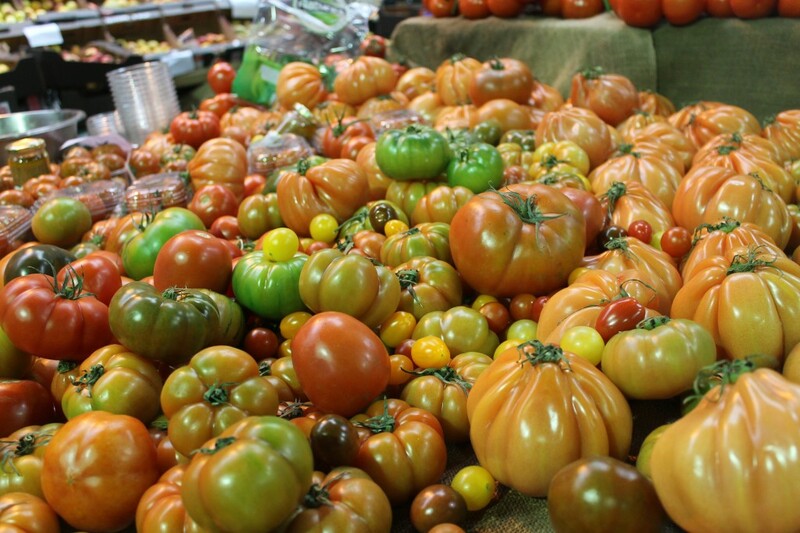 All in all, Borough Market is a MUST SEE if you like food (who doesn’t? Especially if you’re on this blog…) and are in London. It’s an incredible place to spend the day, wandering, tasting samples of foods of all sorts, and experiencing a wonderful cultural hub. It’s also a stone’s throw away from the London Bridge – also fun to see! I’d love to hear about your favorite London spots – leave a comment down below! Hope you guys enjoyed the first installment of my London/Abroad posts. London is a seriously awesome city, and I’m so glad I get to share it with all of you. Xoxo! This post is really making me miss London! 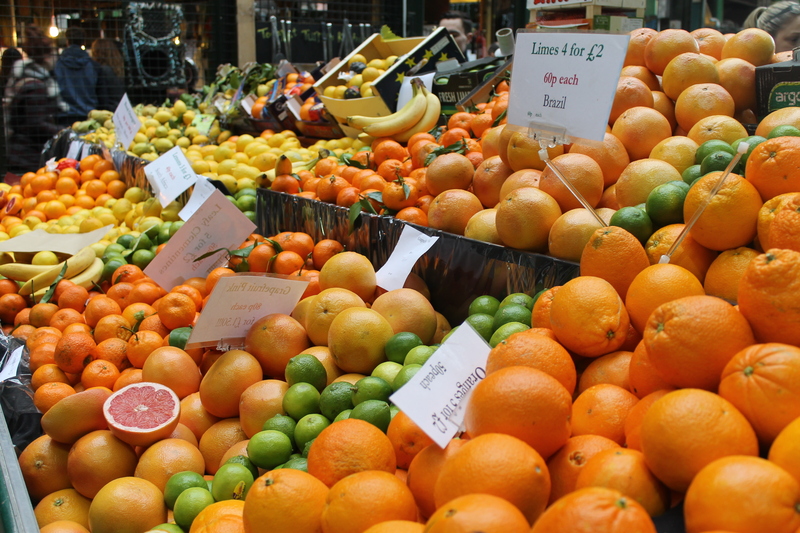 Borough Market is just amazing, I remember spending way too much money there. I should totally not have looked at this post before breakfast. Now my little bowl of oatmeal and egg whites just wont do! 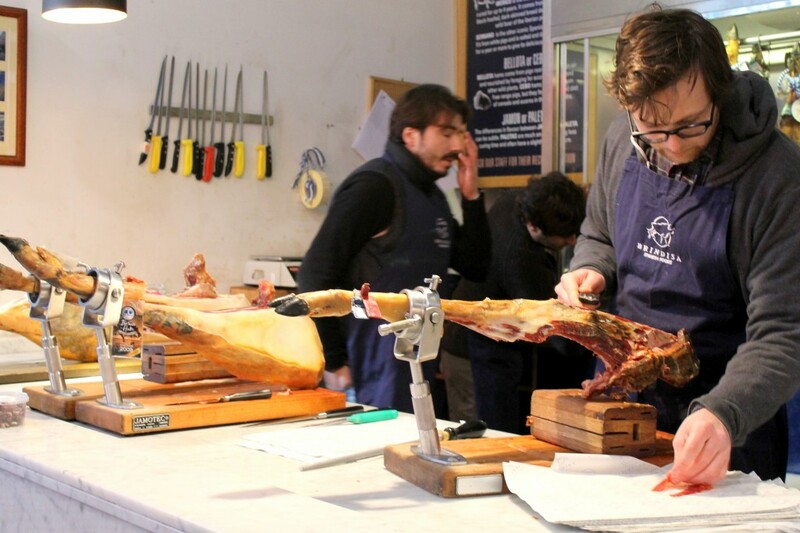 ugh i was OBSESSED with borough market when I visited London during my study abroad semester! You are so lucky you get to travel London which is one in my dream to go list. I am wondering how cold it is there? Those Churro and the sandwich, so delicious. Be safe! They were both so delicious!! It isn’t too cold, usually around 45 degrees F, which is what I’m used to in Washington! Looks quite an adventure just in the Market! London appears to be a foodie’s dream! That churro! I want it! I need to go there just for the food!!! Wow! I really should have waited to read this post until after I ate my breakfast haha bad call!! Now I’m starving and I want a sandwich with lots of cheese : ) Looks like you are having a great time so far with lots of good food! I’ve got a post on my blog about it as well as a few photo’s. The bakery also have three books published too. Have fun if you get a chance to visit there. Thanks Beth! So glad you like the post :) and yes! You definitely need to get to London, especially for that churro. My jaw’s on the floor. All of this looks incredibly yummy, my mouth is watering! I need to go to London, I REALLY DO. Those churros oh my gosh OH MY. 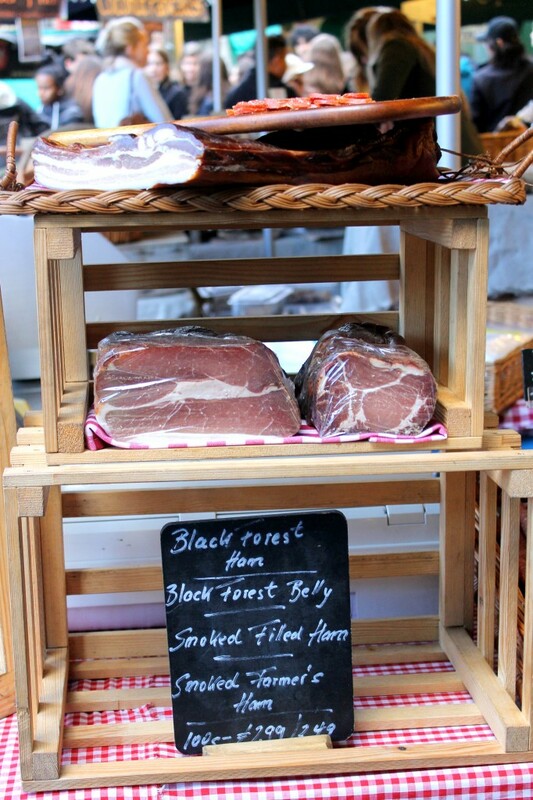 Love this post, and LOVE Borough Market. London really does have amazing food. I think that traditional “British food” is not that amazing, but London is such an international city that there are so many delicious/ interesting things to eat! Simurgh and Tayyabs were some of my favorites places to eat in London! Can’t say I’ve even had tradition British food since I’ve been here, but what I have had has been amazing! Thanks for the recommendations, I’ll need to check them out for sure. Thanks for stopping by! I didn’t read your post, all I saw was Duck Confit Brioche! That’s like a bucket list for me! It all looks wonderful Rachel! You just made me so hungry :) Glad you’re having a great time! Thanks for the suggestion Jess! I actually hadn’t even heard of the Real Food Festival, but I just looked it up and send it to my friend. Definitely will be checking it out soon! Oh my gosh. I want that Focaccia bread. I enjoyed every word (and bite!) of this. That is a ridiculous amount of incredible looking food. I would be afraid to be in the midst of all of it! I’m inspired by the raspberry chocolate cake and those sandwiches, oh man, those sandwiches! Gorgeous pictures, Rachel. this market looks fantastic! i wish i was there! Oh.My.Goodness. This place is amazing!I would definitely be in danger of my stomach exploding! This is the most beautiful market I’ve ever seen! I’d love to be able to see it, or something like it, someday!! What an incredible experience! Amazing post! Please keep snapping pics so I can live vicariously through you. All of this food looks so delicious!! So fun! I used to live in Camden Town, so your post brought back all sorts of great memories. I loved the jazz club (is it still there?) and ran every morning in Regents Park. If you like vegetarian food, I recommend Food for Thought in Covent Garden–hearty food, good portions, fun communal atmosphere. Thanks for the recommendation, I’ve been majorly craving veggies recently so I’ll be sure to check it out! You are so lucky to have had the chance to go there Rachel. I completely agree with you, I don’t think London has terrible food at all! In fact, I think the food there is much more organic and local than the process food we have here in the states. I am loving all of the food in the pics I can’t even pic one!! 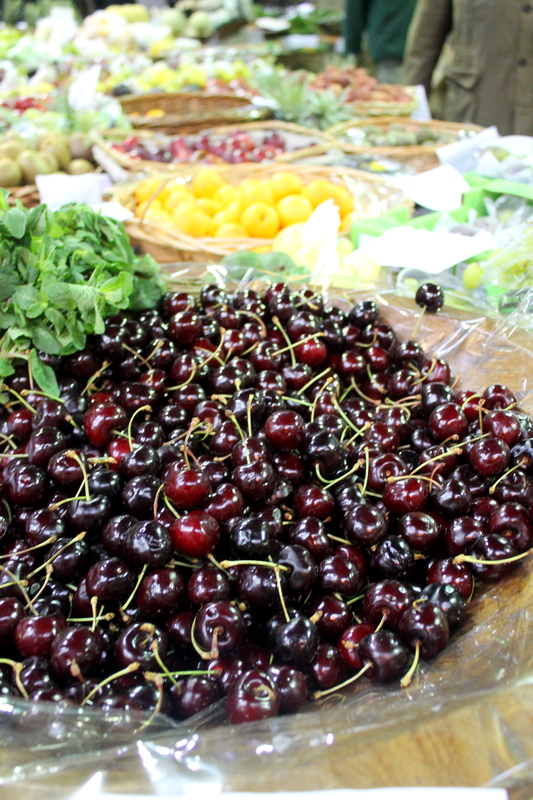 Wow, everything at that market looks amazing!!! I wish I could go right now. Drooling…. London’s (and the UK’s) food is VERY different from what it was 20 years ago (I know, because I lived there then). It has really changed. What they used to say about British food was VERY true. It was horrendous. It’s completely different now. So fun! I wish I were there! It looks like you’re having a great time :). Next time you head back to London you should check out the less well know Netil Market, Maltby St Market, Brockley Market and my personal fave the real food market on the South Bank of the Thames – pick a weekend when Kerb market also resides at that same spot – it is foodie heaven like you would not believe! I used to live 30 mins away and all that was on my doorstep regularly, now I live in Scotland and I miss London like crazy!!! So glad you enjoyed the food on your trip! I’m actually living in London, and I’m so surprised I haven’t heard about those markets! 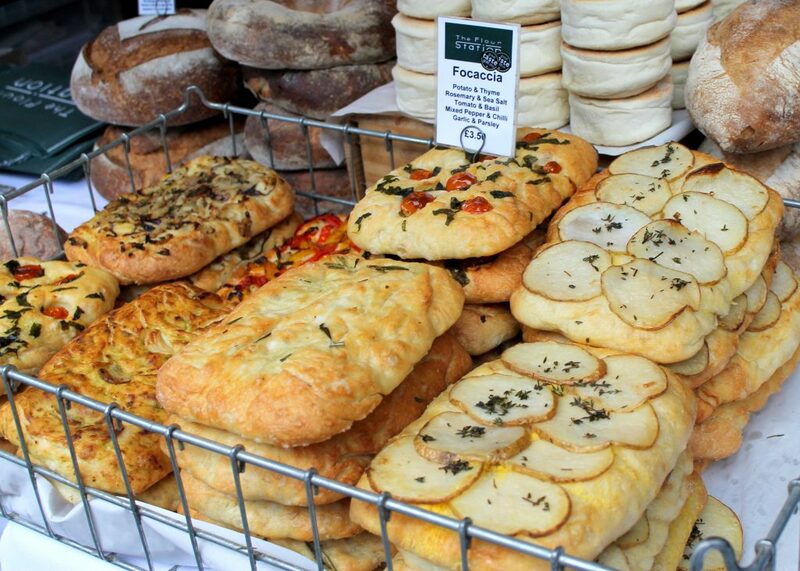 Definitely going to be checking them out :) so many good food markets in London, it’s crazy. Thanks for the tips!